The Animals collection is notable for its design, in this case a cheerful flamingo, and is suitable both for baby and children's settings as well as for the rest of the house, including the living room, dining room and bedroom for a tender, fun and surprising effect. 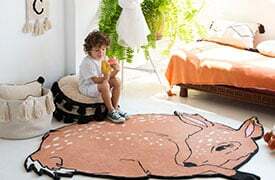 The Lola the Flamingo woolen rug is made with wool of exceptional quality on a 100% cotton base. Hand-made by craftspeople using the ""Hand Tufting"" technique, only natural dyes have been used so it is perfectly child-friendly. 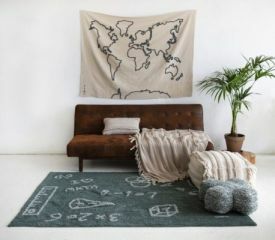 Woolen rugs are more rigid and thicker than cotton rugs and are very popular in the international trends of decoration. Quality: this product is made using the best quality wool over a cotton base. Handmade: each fiber is woven one by one over the base of the rug, which is a technique known as Hand Tufting. Eco-friendly: made only using 100% natural, nontoxic dyes. Consistency: tougher and thicker than the cotton rugs, and also very smooth. A handmade and a carefully designed product. Each piece is unique, which is why there may be small variations in color and shape. This product complies with all quality and safety regulations for children. ISO 9001, ISO 14001, ISO 18001certified. Don't worry if lint appears, as this is residue fiber produced from cutting the wool. 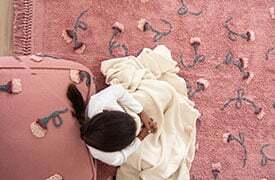 During the first few days, it is advisable to brush the rug with a hard brush in the direction of the plush, and then it is recommended to use the vacuum cleaner. Avoid direct and continual contact with the sun. Clean stains immediately with a damp sponge.